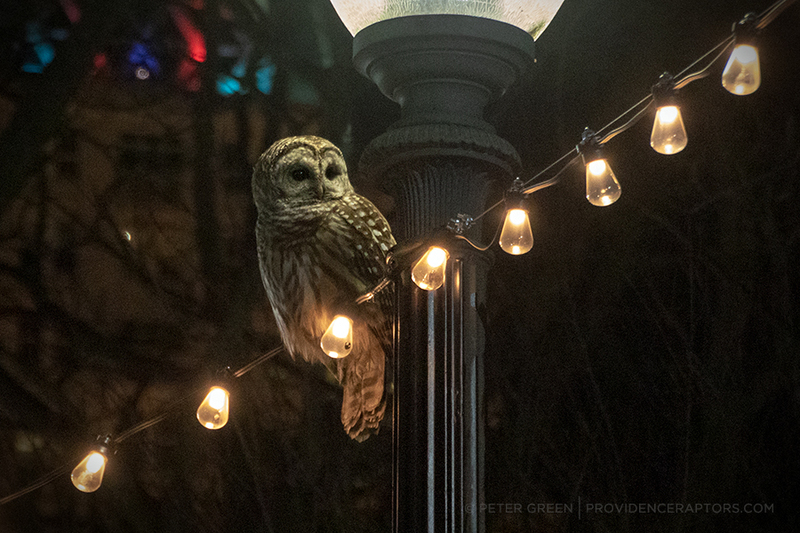 This past winter, for four months, Burnside Park had a special resident, a Barred Owl. Luckily for Providence, a new raptor downtown means that Peter Green from Providence Raptors is not far behind, camera in tow. 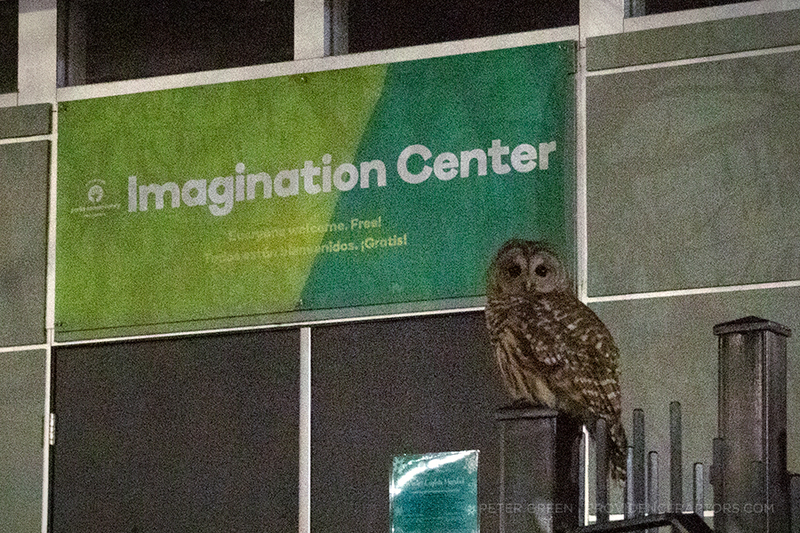 Peter first heard about an owl being seen around the neighborhood by one of the Downtown Improvement District ambassadors. Peter and his good friend and fellow bird enthusiast Christine Francis, who owns Carmen & Ginger in The Arcade, headed out into the neighborhood to look for the owl. Little did they know they would spend the next four months getting to know this owl intimately. But first, they needed to find it and they figured they would start looking in downtown’s biggest green space, Burnside Park. Once there, they set out trying to figure out where the owl might be by looking … down. According to Peter, one can often figure out what is up in a tree by finding the bird droppings under the tree. Sure enough, they soon located the owl’s favorite tree. 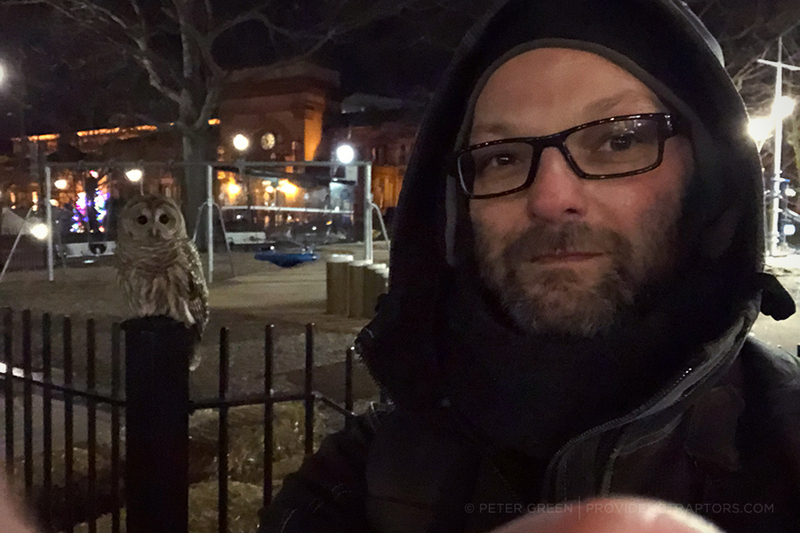 Despite Barred Owls being one of the most popular in the northeast, neither Peter nor Christine had ever seen one before and finding it in a park so close to home felt like magic. Part of that magic is because Barred Owls are notoriously difficult to watch hunt. Unlike the Red-Tailed Hawks and Peregrine Falcons which residents can watch hunt while they wait for a bus, Barred Owls hunt at night, in the dark, and are silent when they fly. In Burnside Park though, it was different. The park has strings of lights installed around the park, and the street lights in Kennedy Plaza provide a lot of light. Not only were Peter and Christine able to watch it hunt at night, they were able to take many photos and videos, being sure to always give the owl ample space to hunt and behave naturally, without knowing it was being observed. It helped that Christine and Peter were there together, and could keep their eyes focused on different areas of the park to try and figure out where the owl was, and where it might fly next. Just as often as they would see the owl, there were just as many nights the friends saw nothing at all. At night around dusk, the owl would start hunting. It would go from tree to tree, maybe relax on the Bajnotti Fountain, or a flag in Brandon’s Beach playground, even perhaps sit on a park bench. 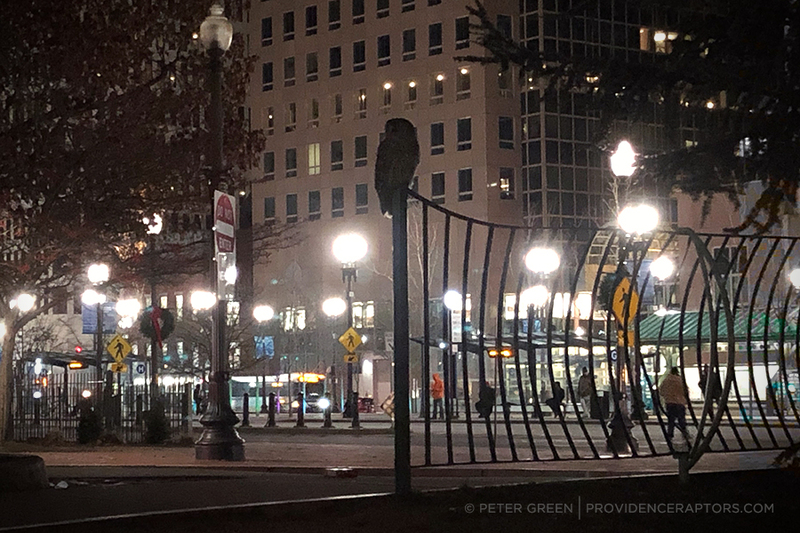 Commuters getting off buses in Kennedy Plaza would stop in their tracks, fascinated; or just as often walk right by as if it were nothing unusual to see an owl on a fence. Skaters at the Alex + Ani City Center would be skating around to pop songs, while this owl perched on a nearby railing. Peter speculates that the owl is male since female owls tend to be larger. He also guesses that it is fairly young, as it seemed to be figuring out how to hunt. In fact, the owl was even bitten at one point attempting a meal that fought back. He learned from his mistakes though and by the end of the season was hunting like a pro and even starting to hoot for a mate. It was a truly unique experience that connected Peter and Christine to the park in a new way. Christine feels like she knows every square inch of the park and enjoyed spending time there, even in the winter. Keeping focused on an owl as it flies around keeps her totally in the moment, which is one reason she loves birdwatching. Together Peter and Christine also felt like they were learning a lot about Barred Owls, and trying to note different owl hunting behavior. With such a clear view of an activity usually done in the pitch dark, it offered them a unique perspective for study. 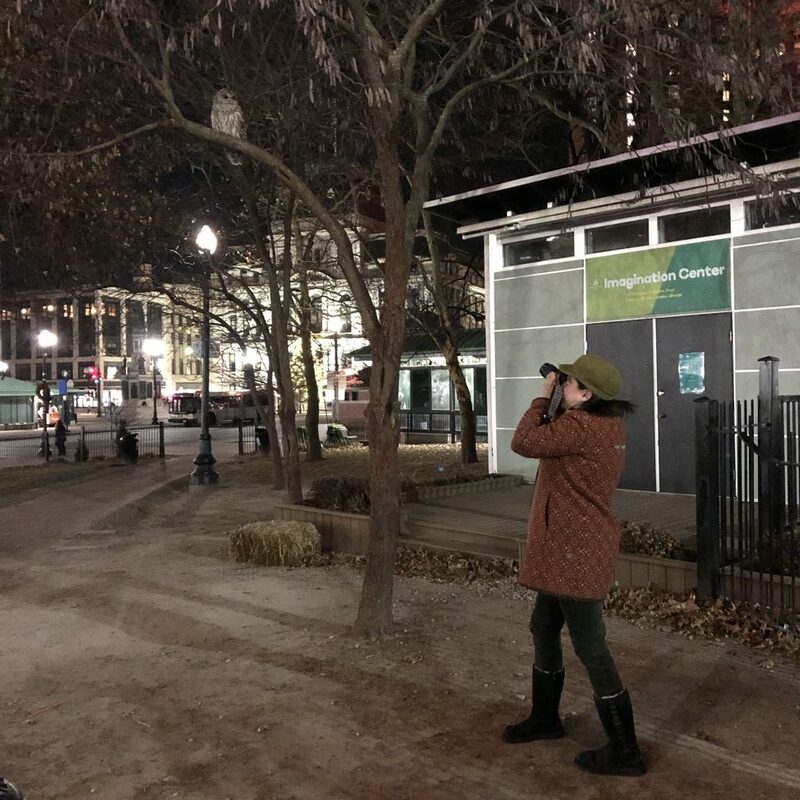 Our urban wildlife is an exciting part of downtown Providence and there are many ways you can help to keep their habitat safe. 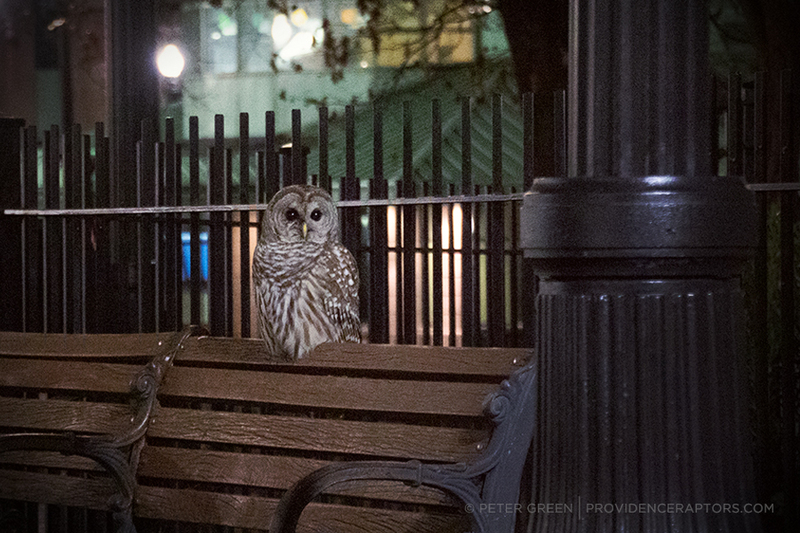 This Barred Owl took up residency in Burnside Park, partly because there was plenty of his favorite food, rats. While all parks have some rats, we don’t want so many rats in Burnside Park that they pose a health hazard to humans. To help cut down on the number of rats please don’t feed the pigeons, don’t leave uneaten food in the grass or on park benches, and dispose of all your food and food wrappers in proper bins. Never leave food out for the raptors, but instead bring your binoculars and enjoy watching them hunt as nature intended. 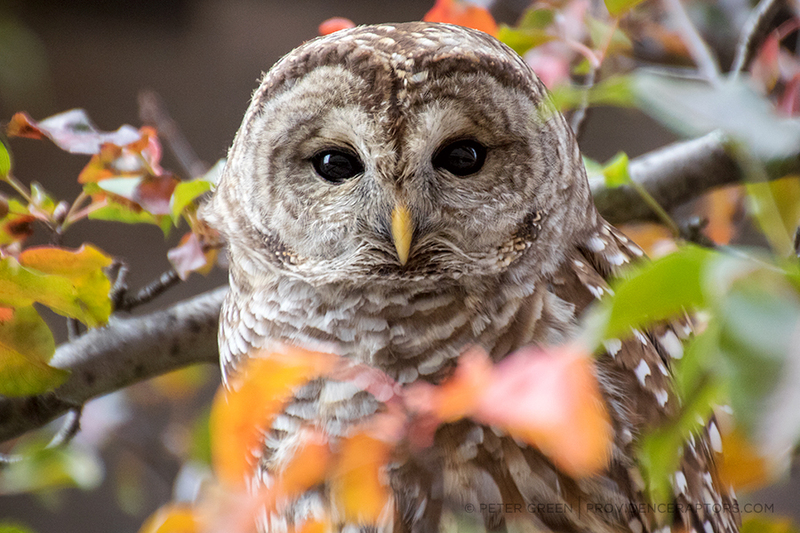 Check out this incredible video of the Barred Owl in Burnside Park made with photos and video that Peter and Christine took over the past four months. Did you spot the Barred Owl this winter? Tweet us and tell us about your experience. All photos courtesy of Peter Green at Providence Raptors.